This is nothing but the differential scheme of the protection of busbar. The circulating current principle states that under normal working conditions or external fault conditions or external fault conditions, sum of the current entering the bus equal sum of the currents leaving the bus. Under any normal conditions in the protected zone i.e. short circuit or phase to phase faults, the current condition gets distributed and sensing this the relay can be operated. The Fig. 1 shows the principle of circulating current protection of busbar. 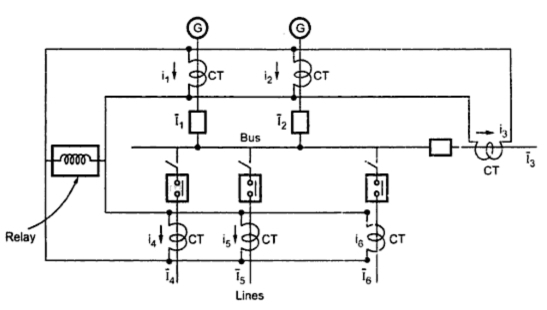 I1, I2 ........... I6 are the currents in the circuits connected to the busbar. Under normal condition, Σ I = 0. No current flows through the relay and hence remains inoperative. Where Īf = Fault current = Unbalanced current. The unbalanced current flows through the relay and the relay operates. Under normal conditions, currents in the secondaries of CT balance each other and no current flows through the relay. Thus relay is inoperative. Under any fault conditions, the fault current flows through relay coil to activate it. To obtain exact balance of currents, all current transformers must have same ratio. But in practice there exists a difference in the magnetic conditions of iron cored current transformers and false operation of the relay is possible, at the time of external faults. For large fault currents there is a possibility of saturation of the cores of current transformers. To overcome such difficulties, a special type of C.T. having no iron core is used. It is called linear coupler. The linear coupler has a property that its secondary voltage is proportional to the primary current and the secondary windings of all the linear couplers are connected in series to the relay. This is shown in the Fig. 2. The sum of the voltage outputs of linear couplers is equal to the vector sum of the voltages in the circuits connected to the busbars. Hence under normal conditions overall voltage in the secondary circuit is zero and relay is inoperative. Under fault conditions, there is resultant voltage in the secondary and the relay operates. A high impedance relay can differentiate properly the internal and external faults compared to normal low impedance relay. Hence in circulating current protection, high impedance relays are used. 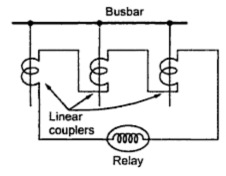 A high resistance is connected in series with relay operating coil to get high impedance relay. This resistance is called stabilising resistance.